Theses smartphones Sony Xperia XA1, XA1 Plus and XA1 Ultra are now receiving Android 8.0 Oreo update. This is not the first Oreo Update from Sony. Last year October, there was a similar update as well. The Sony Xperia XA1 smartphone features a coo specification of 2300mAh battery with 8MP front camera and another 16MP front camera. The update is currently rolling out in a large number of countries. While the oreo update size around 885MB and includes the February Android Security Patch. 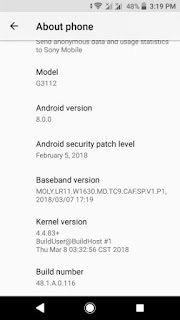 The update changes the developers build number from 48.0.A.1.131 (Android 7.0) to version 48.1.A.0.116 (Android 8.0.0). The above image shows more about the Sony Xperia XA1, XA1 Plus and XA1 Ultra Oreo Update.